Years before his embarkation on a scholarly quest for value-free truths about society, Weber had stated his motivational force in the form of a pedagogical ideal: ‘We do not want to train up feelings of well-being in people, but those characteristics we think constitute the greatness and nobility of our human nature.’5 The work of the cultural scientist expresses the immanent political goal of evoking the noble side of human character. Political morality remained an abiding concern for him, as reflected in his comments on the dialectic of the ethics of conviction and responsibility. Weber seems stranded between scientific detachment and political commitment. There is a further problem. To the extent that the personality of the law-giver (and one who creates a community of judgement is a law-giver) appeals to an ideal of nobility, the charismatic person must appear, intuitively, to be a bearer of noble qualities. But perceptions of nobility change over time. Charisma is unstable. The greater the degree of stability, the closer the charismatic figure is to being noble; that is, representing the Absolute in popular consciousness – hence the attempt to harness charisma to the functions of state.6 Stability in charisma signifies that the perception is acknowledged over time, unlike Hitler’s for example, which dissipated rapidly during the Second World War. But placed as we are in history, how do we theorize a historically fluctuating perception? This could be an intractable problem, but we must think about it. A political system that relies increasingly upon tyranny to preserve itself, whose functionaries seek to secure its civilization via increasing doses of intimidation, is a system on the edge of disintegration. Charisma is not reducible to an aspect of an individual personality, though personal strength and style are essential to it. Nor is it a quality bestowed upon the charismatic figure by an adoring public. It lies, rather in the resonance between leader and followers, and signifies an awareness of historical needs. These needs include psychic expectations that may take many forms, some of them conflicting with others. But howsoever substantial be the public mood, the emergence of a charismatic personality remains a fortuitous event, irreducible to objective determinations. It would be a travesty of historical method to say that had there not been Gandhi, someone like him would have appeared on account of historic necessity. I find it noteworthy that the word ‘resonance’ carries an acoustic meaning. This means that certain emotions and ideas are awakened in the followers, who in turn will the leader to nurture those feelings and ideas in furtherance of the cause. Charisma is a psychological power and expresses self-recognition on the part of everyone involved, a recognition of qualities of head and heart of which they were previously unaware, or only dimly aware. 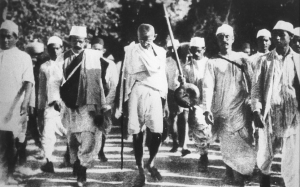 It was Gandhi’s capacity to pierce the hearts of everyone, including those who were personally engaged in violence and killing, that lay at the heart of his charisma. His reputation as a tireless worker for communal harmony. Since the subcontinent has been plagued by communal strife, and since a communal Partition took place despite Gandhi’s best efforts, a nostalgic memory of those efforts persists. His stature as the man who prised India’s freedom from the grip of the mighty British Raj. The people’s experience of Gandhi as a leader who remained physically close to his most humble compatriots, scorning police protection, who did not flinch from placing himself in dangerous places. His insistence on the secular character of public space in independent India. His charisma lent legitimacy and weight to the norms he wanted to see inscribed in the Indian Constitution. 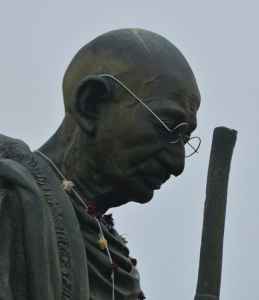 A renewed interest in Gandhi’s critique of modern technology. From Lawrence Vogel’s introduction to H. Jonas. 1996. Mortality and Morality: A Search for the Good after Auschwitz, Evanston: Northwestern University Press, 17. D. Owen. 1994. Maturity and Modernity: Nietzsche, Weber, Foucault and the Ambivalence of Reason, London and New York: Routledge, 91–93, 101, 96. Owen, Maturity and Modernity, 130–31. M. Weber. 1978. Economy and Society: An Outline of Interpretive Sociology, 4 vols, ed. Roth and C. Wittich, Berkeley: University of California Press, vol. 2, 1117. Emphasis added. From ‘The Nation State and Economic Policy’ (Freiburg Address); cited in Owen, Maturity and Modernity, 98. I refer to the Absolute not as an eternally valid and unquestionable Order, but as a manifestation of law and social stability. D. Rothermund. 1991. Mahatma Gandhi: An Essay in Political Biography, Delhi: Manohar Publications, 34. ‘Nobility is a perception, not a concept. Or – what comes to the same thing – our concept of nobility is rooted in a perception, not in another concept …[;] nobility is a value, an estimation, a ranking, and therefore it is an ambiguous mixture of aesthetic and moral qualities that may be named and understood but that must in any given case be recognized directly.’ Rosen. 1989. The Ancients and the Moderns – Rethinking Modernity, New Haven and London: Yale University Press, 12. A neologism that can roughly be translated as ‘Gandhi-like behaviour’. From the memoir of G.D. Khosla, cited in R. Gandhi, Mohandas, 654. Cited in R. Gandhi, Mohandas, 633.